Do foods have stereotypes too? Because meatloaf has always felt like a Sunday meal to me. I bet it’s the Sunday special at several restaurants and the last time I heard my brother mention making meatloaf to his girlfriend he said “you’ll probably want to make that on Sunday, right?”. It takes me back to my childhood…my parents cooking meatloaf and mashed potatoes for dinner as the fourth load of laundry was going in the washer, piles of folded clean clothes were taking over the couches waiting for their owners to collect them and the Browns football game was playing on TV turning my Dad and brother into at home coaches and announcers! It’s funny how such a simple memory can be remembered in great detail. I can picture it all perfectly. 🙂 But should we really be limiting meatloaf to Sundays? Kinda rude of us, don’t you think? I’ve made this turkey meatloaf so many times since discovering the recipe. I love making this on a weeknight mostly because it’s.just.so.easy!! 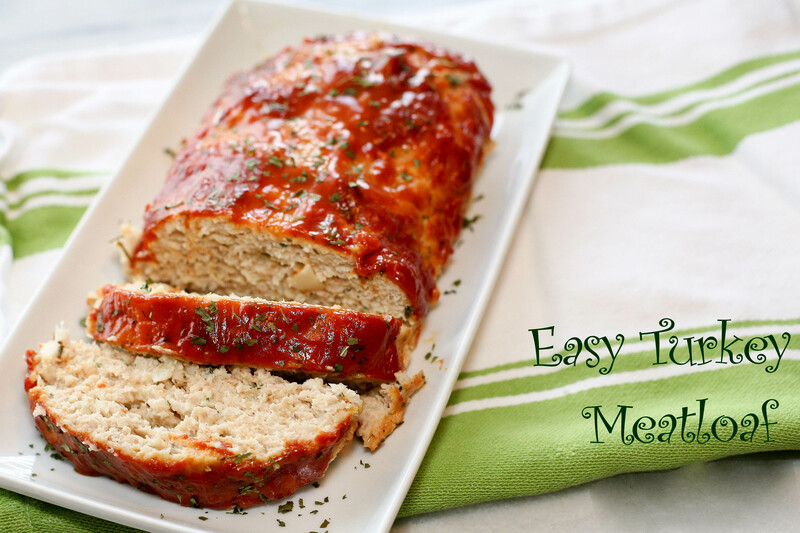 Wednesday is a great day for this turkey meatloaf since some of us (me!) start to get a little lazy around Thursday when the work week begins catching up with you! Hello yummy leftovers. And there I go trying to create a stereotype for turkey meatloaf now! We’ll just call it the Weeknight Meatloaf. Preheat oven to 350. In a small bowl, mix together brown sugar, mustard and ketchup and set aside. In a large bowl, combine ground turkey, egg, onion, milk, bread crumbs, salt and pepper. Mix well. Transfer the meat to a lightly buttered 9×13 baking dish. Using your hands, form meat into a loaf. Add another dash of salt and pepper, if desired. Pour sauce over top the meatloaf and sprinkle with dried parsley. Cover and bake for 45-50 minutes or until cooked through. Internal temperature should reach 165 degrees Fahrenheit. This entry was posted in Dinner, Recipe Book and tagged comfort food, easy meatloaf recipes, ground turkey recipes, turkey meatloaf, weeknight dinner recipes. Bookmark the permalink. Me too, especially this time of year! I love your post about owning your own bakery! It sounds amazing!